Why is it so difficult to understand other people? Little mistakes, circumstances, difference of opinion, different race, different religion, different cultures all make us misunderstand each other. Our daily lives are filled with these misunderstandings. Whether a minor action or major, people tend to misunderstand it and don’t even bother to find out the reason for that particular action. Misunderstandings leave you feeling low, angry, unhappy, cheated, and above all unwanted. Many a times we just stand up again again and again to strive through live. Humans are a resilient lot, but how much can one withstand injustice, ill treatment and misunderstanding? The world is increasingly becoming a place where fellow humans are becoming less tolerant resulting in bad actions, bad words, misunderstanding and ill feeling. Will we ever become a one peaceful world, supporting each other and truly being what humans are meant to be… tolerant, peaceful understanding and friendly. 148 students carrying on their daily routine were suddenly killed and countless others went through a grueling fearful experience at the University in Garissa a few days ago due to terrorism. Yet again our country has to face another attack by cruel heartless terrorists. Please pray for all those who died, for those that are still recovering in the hospitals their families and the country on the whole. 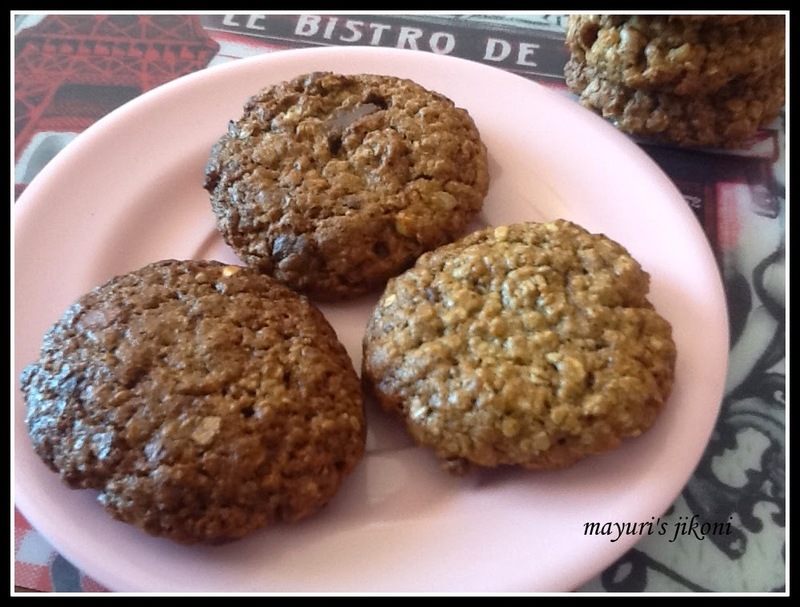 Coming to today’s recipe, I had some banana oat cookies in Bangalore and loved them. However they were a bit too sweet so decided I had to try baking them at home. I baked them a few days ago. The recipe has no butter, no eggs and adding the bananas made them deliciously chewy and slightly crunchy on the outside. Peel and mash the bananas. Add oil, vanilla extract and sugar to the mashed bananas. In another bowl sieve flour, soda bicarbonate, salt and cinnamon powder together. Add oats, nuts and chocolate chips to the flour mixture and mix well. Whisk the banana mixture till it becomes frothy. Add the flour mixture to the banana mixture and mix well. Let the mixture rest for 5 minutes. It will be runny and liquidy. The oats will soak up the extra liquid to make it pliable. Grease baking trays with oil or butter. Wet your hands with water and roll a tablespoonful of the dough into a ball. Place it on the greased tray and flatten it. Continue step 10 with the rest of the dough. Remember to wet your hands to avoid the dough sticking to your hands. The cookies should be about an inch apart as they will spread a bit on baking. Bake the cookies for 10 -12 minutes or till the cookies are light brown. Immediately remove the cookies from the greased tray and place them on a wire rack to cool. Add only nuts or only chocolate chips if you want. If the bananas are a bit overripe then you may need less sugar. I made big cookies so I got 32. If you make smaller ones, you will get more and also keep an eye that they don’t get burnt. I prefer to grease the tray with butter. These look really delicious and I love that they are eggless too. I will try this for sure……..
Really upset watching the news in Kenya. My heart goes out to all those parents who lost their innocent kids. It is such a beautiful place being spoiled by a few. Your biscuits look great and I like the idea of not adding any butter when making them.